What’s the Matter with Threshold Concepts? ACRLog welcomes a guest post from Lori Townsend, Learning Services Coordinator at the University of New Mexico; Silvia Lu, Reference and Social Media Librarian and Assistant Professor, LaGuardia Community College, CUNY; Amy R. Hofer, Coordinator, Statewide Open Education Library Services, Linn-Benton Community College; and Korey Brunetti, Librarian at City College of San Francisco. Recent conversations about ACRL’s draft Framework have raised questions about both the theoretical value of threshold concepts and their usefulness as applied to information literacy instruction. This post responds to some of the arguments against threshold concepts and clarifies why the authors believe that the model can be a productive way to approach information literacy instruction. Au contraire: threshold concepts are grounded in research on teaching and learning. The theory initially developed from qualitative research undertaken by education faculty as a part of the Enhancing Teaching-Learning Environments in Undergraduate Courses project in the UK. The references for Meyer and Land’s initial series of papers on threshold concepts represent a well-rounded list of important thinkers in education. That said, we understand why some might see threshold concepts as “old wine in new bottles” (as Glynnis Cousin puts it) (1). If you have a background in educational theory, threshold concepts may seem like a repackaging of other theories. Threshold concepts might even be understood as a shortcut through the theory thicket for those who don’t possess an advanced degree in education. It’s also helpful to note that the threshold concept model works well when used alongside other pedagogical approaches. To provide just one excellent example, Lundstrom, Fagerheim, and Benson (2) used threshold concepts in combination with Decoding the Disciplines and backward design as a frame to revise learning outcomes for information literacy in composition courses. Another common objection has to do with the fuzziness of Meyer and Land’s definitional criteria (transformative, irreversible, integrative, bounded, troublesome) and the hedging language Meyer and Land use to articulate the criteria (probably, possibly, potentially). We see the use of these qualifiers as Meyer and Land’s way of saying: just because a proposed threshold concept doesn’t meet X criterion, doesn’t necessarily mean it’s not a threshold concept. Along these lines, Wiggins and McTighe’s work is highly respected as a now-standard approach to curriculum design, but if you look at the chapter on “big ideas” in their classic work Understanding by Design, you’ll see similarly fuzzy, but still useful, language. However, regarding these fuzzy definitional criteria, some have asked “How can probable characteristics be defining characteristics?” (3) Let’s look at a furry example: dogs. Do dogs bark? Do all barks sound the same? Are there dogs that don’t bark? Yet somehow, we can still identify dogs as dogs for practical purposes. Likewise, instructors can still identify threshold concepts because we possess professional and disciplinary expertise. Arguing for the existence of threshold concepts that meet none of the definitional criteria is a rhetorical device, not a practical concern. Librarians are just not going to waste precious instructional time on nonsensical learning objectives that aren’t real teaching content. Threshold concepts are an emerging theory. However, many disciplines have used them to effectively re-think curricula, including Computer Science and Economics. We maintain that much of the value of threshold concepts lies in encouraging instructors to re-engage with and re-examine teaching content. They are a wonderful catalyst to spark discussion among colleagues and encourage deep and creative thinking about instruction. Nevertheless, some librarians are bothered by an approach that isn’t supported by a certain kind of evidence. There are many possible pedagogical approaches out there and we don’t have a stake in people adopting threshold concepts if the model doesn’t work for them. At the same time we can also ask, how much of what librarians do effectively in the classroom is supported by positivist proof? To take one example, we don’t need a double-blind study to know that the Cephalonian method works in our classes. We know it works because students who came in slouching and checking their email are paying attention, sitting up straight, and asking their own questions. This is a form of evidence. Other kinds of evidence are forthcoming for threshold concepts (for example, we are slowly writing up the results of a Delphi study on threshold concepts for information literacy), but that does not mean we cannot use them now to improve our teaching. We find it nearly impossible to teach a skill-based learning objective effectively if we don’t have a firm grasp on why it’s important because of its connection to an overarching concept. Students can smell busywork a mile away. And transferrable skills are the ones anchored in conceptual understanding. 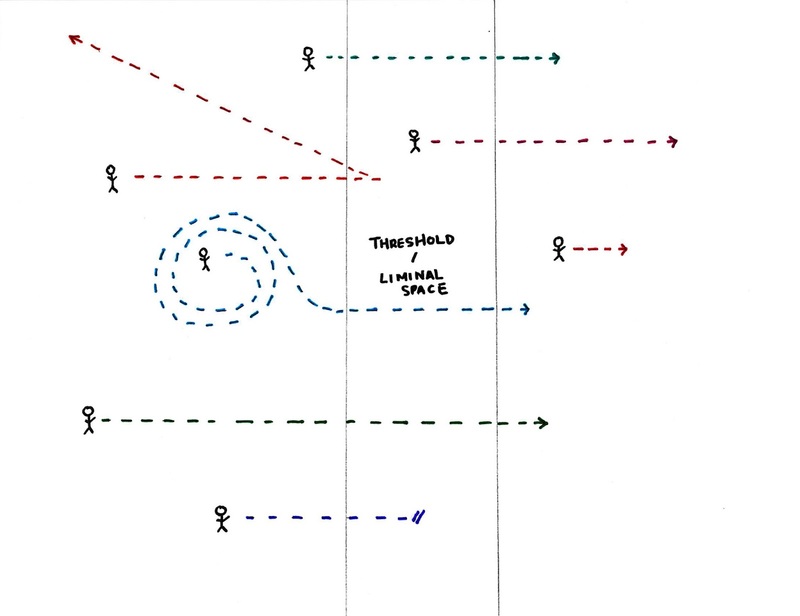 In applying the anthropological concept of liminality to learning, Meyer and Land imagine and explore a liminal space that learners pass through in the process of crossing a threshold. They write about how individuals will move through this liminal space in different ways, spend more or less time there, and experience affective dimensions of learning there. (5) As Silvia’s diagram below shows, some people encounter a learning threshold and walk right across; others will take a few steps forward and a few steps back before crossing; others will sit down in one spot for weeks when the threshold comes into view. Learners do not start a course in the same place, nor do they learn at the same pace. On the other hand, to suggest that student experiences are so fundamentally different that there are no common points of confusion is anathema to the possibility of curricular design. Moreover, what then would be the point of teaching and learning in communities? We can focus our teaching efforts by pinpointing the places where students are most likely to get stuck, without ignoring their differences. Threshold concepts are not tools of oppression. Or at least, they may be so, but only to the extent that an individual practitioner using threshold concepts is oppressive. Threshold concepts expose the tacit knowledge that we expect our students to absorb along with our stated learning objectives. This approach forces us to consider the implications of asking students to look through our disciplinary lens. For example, if a student wants to search the catalog using the keyword “drag queens,” you can imagine how well the Library of Congress subject headings reflect the current thinking on respectful ways to talk about this topic. Ignoring such an issue would implicitly validate the problematic subject terms. It is paramount to acknowledge the language problem and explain that the subject terms reflect the point of view of a certain group of people. We run into trouble when we don’t acknowledge our particular lens and act as if it’s the natural way to see the world. Our disciplinary lens has scratches, deformed areas, and blind spots — all rich fodder for teaching and exploration — and yet it still offers something of value to our students. Admitting that we are asking to students to risk their identity and take a leap of faith with us as teachers is only being honest. Do we all agree on what constitutes our disciplinary content? Does every discipline share a unified body of knowledge? Threshold concepts don’t claim so. However, we all make choices when teaching. If you consider your content with the threshold concepts criteria in mind, it helps identify some things that might prove problematic for students and stall their learning, yet that are needed in order to move forward in their understanding. Individual subject experts will have differing perspectives on their disciplines and will thus choose to teach different content, but there are transformative, irreversible, troublesome, and integrative moments along many strands of knowledge. Your curriculum doesn’t have to be identical to mine for both of them to include threshold concepts that challenge our students and enlarge their perspectives. We see the Framework draft as a part of an ongoing conversation and an attempt to nudge our profession in a positive direction toward conceptual teaching. Threshold concepts gave the Task Force one starting place to think about big ideas in information literacy. As we all know, many librarians already take a challenging, big picture approach to content and have been teaching that way for years without threshold concepts or the new Framework. Nobody asserts that the frames are The Only Frames forever and ever. So please, engage with them. Think of new ones. Rewrite them to fit your context and your students. Think hard about what you teach and how you teach it. We have interesting, transformative, transferrable content to teach and it is grounded in our own disciplinary area — threshold concepts or no. And finally, it’s useful to think of threshold concepts as a model for looking at the content we teach in the context of how learning works. “…(A)ll models are wrong; the practical question is how wrong do they have to be not to be useful.” (6) We’re less interested in breaking down the model and examining its component parts exhaustively than in trying it out and seeing if it’s useful. And then maybe tweaking it. For us, despite its flaws, the threshold concepts model continues to be useful. Your mileage may vary. Cousin, G. (2008). Threshold concepts: Old wine in new bottles or a new form of transactional curriculum inquiry? In R. Land, J. Meyer, & J. Smith, (Eds.) Threshold Concepts within the Disciplines. Rotterdam: Sense Publishers. Lundstrom, K., Fagerheim, B.A., & Benson, E. (2014). Librarians and instructors developing student learning outcomes: Using frameworks to lead the process. Reference Services Review, 42(3). Wilkinson, L. (2014, June 19). The problem with threshold concepts [Web log post]. Retrieved from https://senseandreference.wordpress.com/2014/06/19/the-problem-with-threshold-concepts/. Wiggins, G. P., & McTighe, J. (2005). Understanding by design. Alexandria, VA: Association for Supervision and Curriculum Development. Meyer, J.H.F., and Land, R. (2008) Threshold concepts and troublesome knowledge (5): Dynamics of assessment. 2nd International Conference on Threshold Concepts, Threshold Concepts: From Theory to Practice, Kingston, Ontario, Canada. Box, G. E. P., & Draper, N. R. (1987). Empirical model-building and response surfaces. New York: Wiley, p. 74. Timmerman, B., Feldon, D. F., Maher, M., Strickland, D., & Gilmore, J. A. (2013). potential thresholds. Studies in Higher Education, 38, 693-710. Very cool, David. Thank you so much for sharing. Thanks J., the references mis-numbering should be fixed now. I have been looking at threshold concepts as part of my PhD research and found your ideas in this article very useful and thought provoking. I am studying wayfinding as a human experience and its interesting to read your perspective.